The Dragons who once ruled over the land are dead. The motley crew that stole the dragons’ gold and stumbled through a revolution are rich, and praised as saviors. Everyone gets to live happily ever after, right? Well, it might have worked out that way if the dragons in Kondorra had been the only ones. If they hadn’t been just the tip of the spear about to fall upon the whole world . 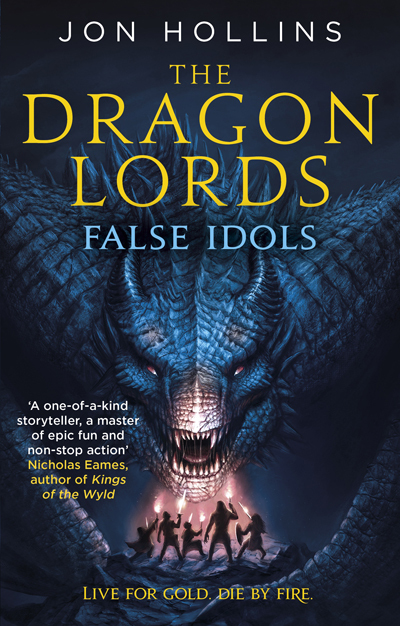 . .
Jon Hollins is a pseudonym for urban fantasy author Jonathan Wood, whose debut novel (No Hero) was described by Publishers Weekly as a funny, dark, rip-roaring adventure with a lot of heart, highly recommended for urban fantasy and light science fiction readers alike. Barnesandnoble.com listed it has one of the 20 best paranormal fantasies of the past decade, and Charlaine Harris, author of the Sookie Stackhouse novels described it as, “ … so funny I laughed out loud”. His short fiction has appeared in Weird Tales, Chizine, and Beneath Ceaseless Skies, as well as anthologies such as The Book of Cthulhu 2 and The Best of Beneath Ceaseless Skies, Year One.